Download a map of the area? The 9.30am meeting point for this short exploration of Holyrood Park was the car park at Dunsapie Loch to the east, but Gwen and I made a wrong turning at the entrance to the Park and ended up on the lower road. So had Mark, who had parked in the lower area with a view to walking back up to the higher road .. so he jumped in our car for the complete one-way drive round to Dunsapie. Bob, Ian and James were already there, and we were soon joined by Steven and Heidi. Lyn, Norman, Briony and David had texted to say they would be slightly delayed, and they took the lower road by mistake as well. I spotted them arriving in the lower car park and phoned to say just walk up the hill to meet us. 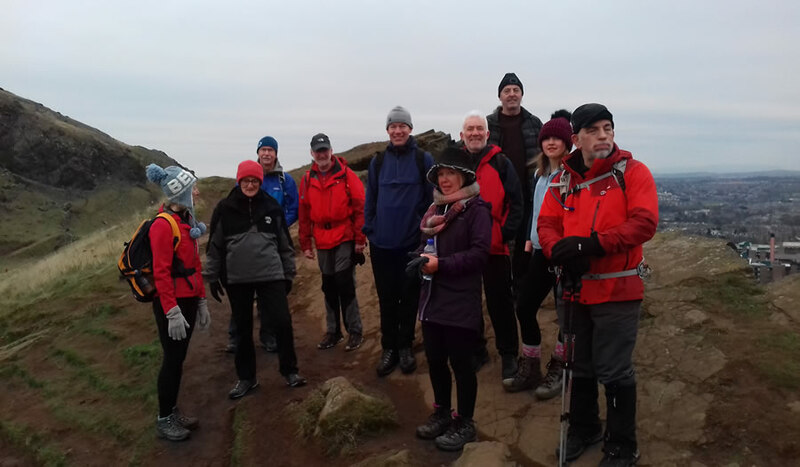 And so the group of 12 set off in clear but very cold conditions for for the short road walk above Duddingston Loch to begin the ascent of the first striking landmark of Salisbury Crags. The views over the city and the Firth of Forth were extensive, and the descent to Holyroodhouse was completed in just over an hour. The next ascent was to the ruin of St Anthony's Chapel which sits on a grassy mound above St Margaret's Loch, followed by a very steep but short ascent onto Whinny Hill. 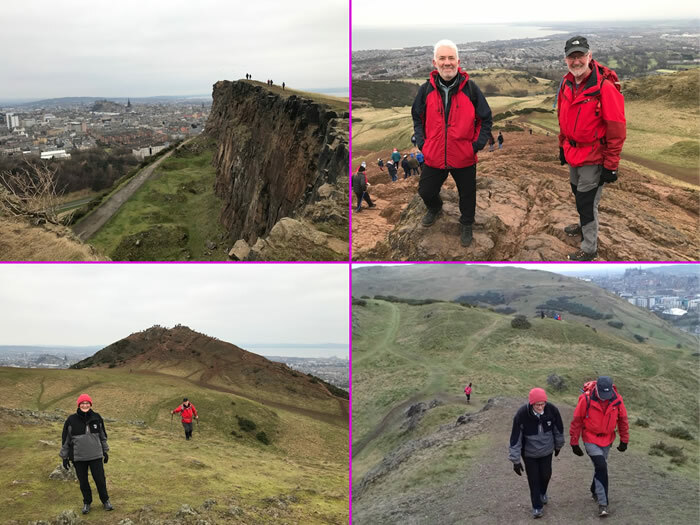 From here, we followed some curious direction markings on the ground to the tourist route and eventually the summit of Arthur's Seat, the former volcano and prominent feature of the Edinburgh skyline. 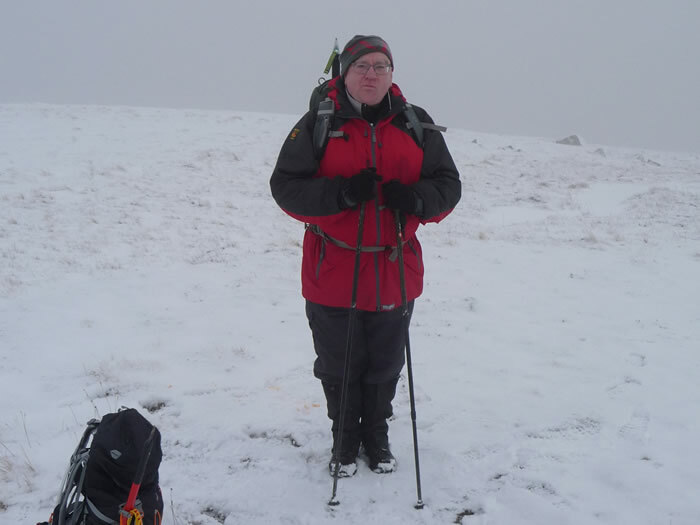 After settling down just below the very busy summit area, we enjoyed the customary christmas cake and nip or two of a port and brandy mix supplied by both Bob and I. While getting ready for the descent, Steven spotted a wallet which had been dropped close by .. it contained a large sum of money in £50 denominations. On discussion, we realised who was likely to have dropped it, and Steven went off to find the owner .. who could describe the distinctive inside of the wallet and who was very relieved to take re-possession. We made the short descent to the car park and agreed to meet at the Toby Carvery at Mortonhall for a post-walk refreshment .. which we did and enjoyed some food as well. The route was short .. only 5.6km with 330m of ascent and completed in 2.5 hours .. but it was a good leg stretch and start to the walking year. The weather and company was good and the views extensive .. what more could you ask .... ? Most people were travelling to Corran quite late on Friday. However, I picked up Allan and Heidi in the morning and we drove to the Glencoe visitor centre. The centre was undergoing renovations, but we found coffee and some excellent cakes in the temporary tea room. From the visitor centre, we climbed Meall Mor via a good forestry track, currently only shown on the 1:25k map, that made for a gentle ascent to its high point, from where we could head south on a path through the cleared forest and on to the summit. The cloud base was high, so the views from the summit were fantastic. In the evening Allan, Heidi and I met up with Debbie and took the ferry to the Inn at Ardgour for a meal. By the time we returned, most of the other weekenders had arrived at the bunkhouse. We were made to feel very welcome by the owners, Halina and Alan. Everybody agreed that the accommodation was excellent. An Irish kayaking group was staying in the second bunkhouse – they were not really much trouble, but there was enough overnight commotion to prompt our hosts to apologise. They insisted on returning some of our payment, which was used to cover most of our communal dinner expenses. Allan and I set off for Binnein Mor from Kinlochleven, but only got as far as the lochan below Sgurr Eilde Mor due to extremely icy and slippery conditions. 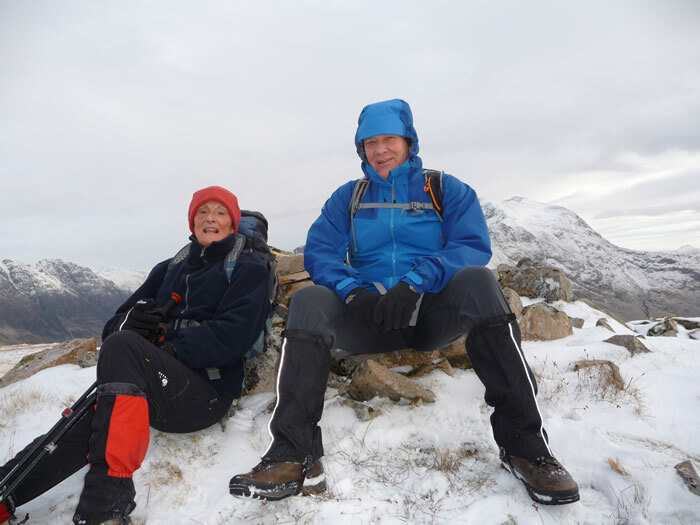 Justin and Kenny took the ferry across to Ardgour and climbed Sgurr na h-Eanchainne. Debbie headed to Fort William and climbed Cow Hill. 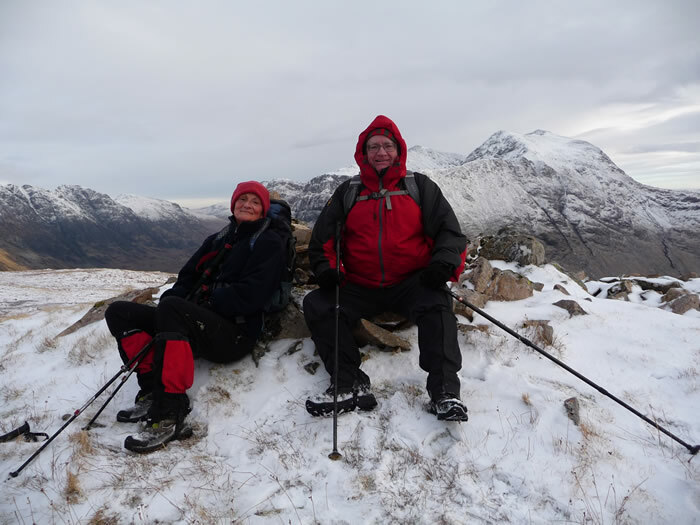 Ally and Cat drove to Glenfinnan and made a bicycle-assisted ascent of Sgurr nan Coireachan and Sgurr Thuilm. Mark, Miriam and Heidi drove to Strontian via the ferry and climbed Sgurr nan Cnamh from the Ariundle visitor centre. Andrew and Ann did a tour to Mallaig. By Saturday evening, the bunkhouse kitchen was a hive of activity as our communal early Burns supper was being prepared. As usual the food was excellent .. thanks to all cooks, peelers, mashers, cleaners and scrubbers. Before the main course, we were treated to Justin’s rendition of “To A Haggis” .. thank you for an excellent Address, Justin! On Sunday morning it was raining quite hard and most of us decided to head for home. 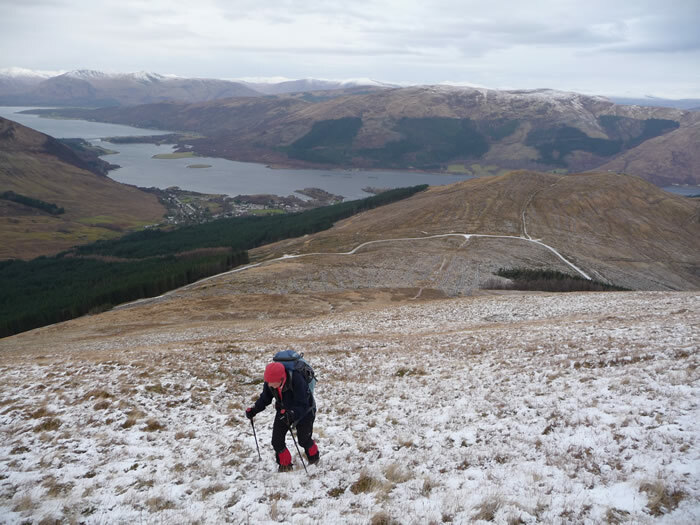 However, Ally and Cat set off to climb Beinn na h-Uamha. Mark and Miriam stopped to have a look at the new “massive” Kingshouse Hotel which is due to open in February. It is certainly a change from the old building! This was our first stay at the Corran Bunkhouse and the general verdict was that it was very comfortable and conveniently located for a good range of walking destinations. Everybody appreciated the tidy bedrooms, all with their own shower room. I’m sure we’ll be back.